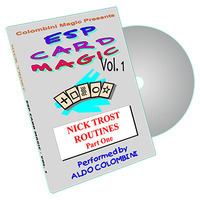 Today, when you order "ESP Card Magic (Nick Trost Routines) Vol. 1 by Aldo Colombini", you'll instantly be emailed a Penguin Magic gift certificate. You can spend it on anything you like at Penguin, just like cash. Just complete your order as normal, and within seconds you'll get an email with your gift certificate. THIS IS THE FIRST IN A SERIES OF DVDS DEDICATED TO TRICKS AND ROUTINES USING ESP CARDS. NICK TROST HAS CREATED DOZENS OF ESP CARD ROUTINES. ULTIMATE CIDENTAQUIN: The deck is shuffled and a spectator picks a card. The deck is then separated into two piles. The cards are mixed according to the spectators directions and at the end, not only do you find the two pairs matching the selection but all the other pairs match! MATTER OF DESIGN: A card is placed face down as a prediction. A spectator deals cards separating the deck into two piles. These piles are dealt again into two and the top card of each of the four packets is revealed: They are (say) four Squares. The prediction is seen to be the other Square! UNA-MINDS: Two spectators note an ESP symbol. One spectator shuffles the deck (you are not looking), mixing face-up and face-down cards. Yet, you locate the two selected cards! ODD ISN'T IT? : You show a packet of eight cards. A spectator freely picks one card. It is the only odd card of the packet (say a Circle, while all the other symbols are Stars)! PAIR-ITY: You lay aside a pair of cards as 'prediction' cards. A spectator selects two cards and these match the predictions! PARADOXICAL ESP-PAIRS: Pairs of cards are placed on the table and a spectator freely chooses two pairs. These are the only matching pairs, all the other pairs do not match! EXTRASENSORY DECEPTION: A spectator picks two cards. He then deals the cards in pairs totally at random and you pick a pair. These two cards match the two selected cards! SYNC-RO-MESH: Two symbols are selected and you predicted them!